Smart Signs created by Smart Sign Media use sensors to capture specific, real-time demographic information about motorists passing by. Advertisers can use this information to present targeted advertisements to drivers. 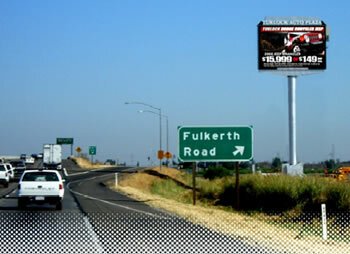 The sign shown above is a 20' x 30' high-definition LED billboard on Hwy 99. It offers 1,536 "spots" per day, where a "spot" is a seven second ad showing. Smart Signs use a SmarTrak RMS "Full Spectrum" electronic tracking module developed by Mobile Trak, Inc. When a SmarTrak RMS sensor is installed on a Smart Sign Media digital billboard it monitors the passive "local oscillator" signals emitted by the FM radios of passing automobiles. Those signals reflect the frequencies to which the radios are tuned. The Full Spectrum system compiles that statistical data and calculates the number of passing motorists, sorted by the stations to which their radios are tuned. Those calculations are commingled with SmarTrak's Media Audit database that contains detailed consumer demographic and purchasing pattern information segmented by radio station format) in order to provide a complete "picture" of the passing motorists. For example, Smart Signs could inform passing motorists about special offers to shoppers as they approach stores or malls. A Smart Sign could entice consumers to respond via text message to a question posed by the sign. Information can even be pulled off the Internet and displayed. "You've been rambling about these signs for weeks now. Tell me, have you actually seen one signaling?" Hathaway tore a handful of leaves from the hedge, exasperated by this irrelevancy. "Of course I haven't, that's the whole point, Doctor..."
Read the previous article Digital Billboards Worth Billions. Story via MarketingVOX. Thanks to Agiani for the tip on the story.